I have been using Food Therapy, which is feeding specific fresh foods to dogs and cats, for the last 3 years of my 14 years as a veterinarian. Changing my patients to fresh food has been the single greatest improvement in their health I have seen in my career. Seeing such an improvement, made me want to know more about the way we feed our dogs. I found many recent studies showing processed carbohydrates in dry kibble are negatively affecting the well being of our precious pets. As humans, we are able to vocalize our opinions about different foods and how we feel after eating a meal. Our dogs and cats, on the other hand, do not have the ability to speak and let us know, “I don’t like that kibble—it makes me feel sick after I eat.” This is why, as responsible pet owners, we must stay informed and be advocates for our pets when it comes to purchasing the safest and most nutritionally sound food..
Carbohydrates are used by humans and animals as a source of glucose. Carbs provide energy when metabolized and prevent protein from being broken down to make glucose. Proteins in your body act as building blocks for muscles, bones, skin, hair and other tissues, and when those proteins are being broken down (because of an inadequate carbohydrate intake), your body is going to have a difficult time building and maintaining important muscles and tissue. So, some carbohydrates argued for us. The same has been found to be true for dogs. Cats’ require a higher meat content ad they are obligate carnivores. And, not all carbs are bad. There are “good” carbohydrates that are digestible and extremely high in nutritional value. Good carbs are also high in fiber, which helps lower insulin levels and bad cholesterol. These good carbs can be found in root vegetables like yams, yuca and taro root. Why are processed carbohydrates bad in kibble? Recently, there has been a shift in the kind of kibble pet owners are buying for their fur babies. Many owners invest in “grain-free” dry dog food because they claim their dog does not need carbohydrates. This statement is half true—dogs can follow diets that do not have any carbohydrates, but kibble that claims to be “grain-free” does, in fact, still contain carbs in the form of potatoes, tapioca, peas and sweet potatoes. Grain-free does not mean carbohydrate-free. Today, dry pet food is created using a process called extrusion, and this process cannot work without a small level of starch (carbohydrates) to hold the kibble’s shape. 95 percent of dry pet food is manufactured using extrusion. During this process, the kibble dough is exposed to high temperatures (around 400 degrees Fahrenheit) for less than five minutes, resulting in chemical and physical changes to the ingredients. After this process, very few nutrients and vitamins remain, further diminishing the value of the kibble that was created with low-quality ingredients from the get-go. The final product is a bag of dry kibble with preservatives and little to no nutritional value. Obesity: High glycemic index (GI) carbs found in commercial dog food recipes cause spikes in blood sugar levels which can initiate a chronic inflammatory response. This kind of inflammation can be a catalyst for a number of different diseases including arthritis, diabetes and obesity. Allergies: Dry kibble with high carbohydrate levels can lead to allergic reactions because of chronic inflammation. When a dog attempts to digest high GI carbs, there is a change in T-cell population that shifts to the proinflammatory Th2 cells, causing a decrease in helper T-cells. Inflammatory bacteria: Lactobacillus, also known as “good bacteria,” is found naturally in our digestive system. When your pet consumes dry kibble that is high in carbohydrates, the bacteria changes from the anti-inflammatory lactobacillus to proinflammatory pathogenic bacteria. Erosion of mucosal lining: Chronic inflammation in the gut eventually begins to erode mucosal lining. This erosion causes disaccharides to flow into the small intestine, and if they are not absorbed properly, water is pulled into the intestine resulting in loose stools, diarrhea, gas and general discomfort. Cancer: Non-healthy sources of carbohydrates increase your pet’s risk of developing cancer, specifically foods with a high glycemic index. Cancer cells depend on glucose to grow, and elevated levels of glucose feed tumors and cancer cells. What else about dry kibble? There are many reasons why dry dog kibble is not something we should be feeding our pets. In addition to the harmful effects of processed carbohydrates in the kibble, there is also a lack in quality of the ingredients and meats used in the food. 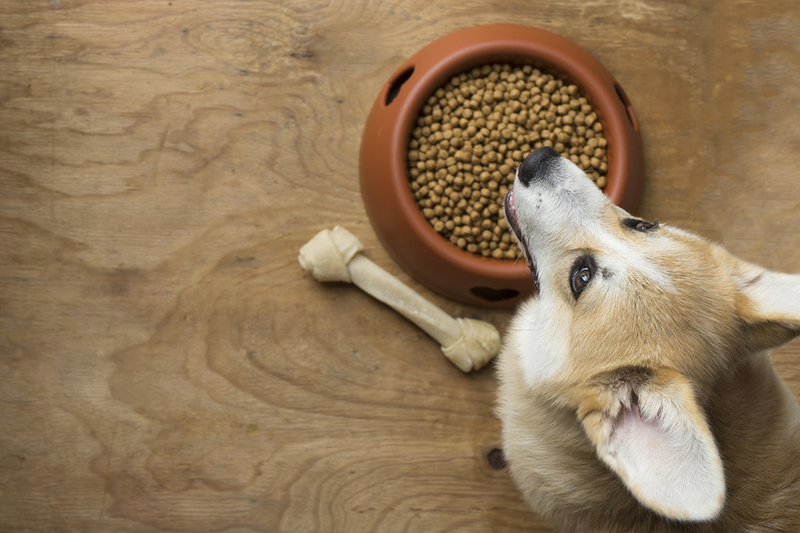 Most ingredients contain unwanted nutritionally active factors that interfere with your dog’s ability to absorb nutrients and properly digest food, too. The addition of old and processed carbohydrates is poorly regulated, meaning there is really no way to tell whether the expensive pet food you’re paying for contains fresh, nutritious ingredients that will be benefit your pup and her total health. An extremely common misconception about kibble is that the more expensive the food is, the higher quality it is. Most dry kibble is created the same way, using similar ingredients, so why should you spend money on such low quality product? Their is a saying in Holistic Medicine “Food is the First medicine” and this idea applies to animals and humans alike! Feeling good means eating nutritionally sound meals that will help your body function fully all throughout the day. I encourage all my clients to think about fresh foods in their dog’s bowls. Think real food- healthy leftovers, whole food ingredients- natural colors in the bowl. Your dog will thank you and you will feel better giving them food you trust.